Over many years, a kentia palm tree can reach several feet in height, making it a striking, tropical floor plant. Give it some elbow room, too. Those elegant, arching fans can grow as much as 1 ft (30 cm) wide and 2 ft (60 cm) long. All of them grow from a single trunk, but growers typically plant several together for a lush, full appearance. This is hands-down the most popular indoor palm tree, and it's easy to see why. 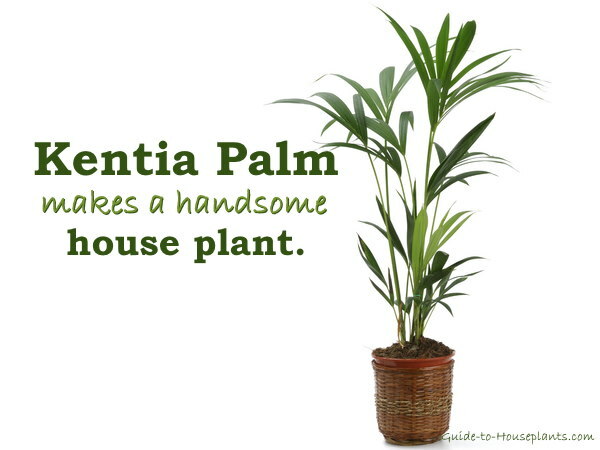 The palm family is large, but only a few kinds of palm trees are tolerant of average home conditions. This dramatic palm is one. Give it a shower. Keep the fronds dust-free by giving your palm a shower. This has the added benefit of flushing the soil of built-up fertilizer. Use a gentle flow of tepid water. Or stand the plant outdoors for a gentle summer (warm) rain shower. Remember to keep your palm out of direct sun. Watch for scale insects. They look like brown oval bumps that tend to lurk on the undersides of the leaflets. Treat any infestation immediately. Repot only when needed. Planting palm trees is only necessary every 3 years at the most. Kentias are slow-growing and don't like to be disturbed. Their roots are fragile, so handle them with care. 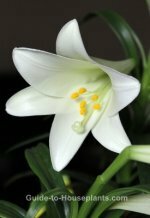 Light: Kentias tolerate shade better than some, but you'll get a healthier, greener plant by giving your palm bright, indirect light year-round. Take care not to put it in direct sunlight, which may cause brown scorch marks on its leaves. Water: Keep soil evenly moist spring through fall; slightly drier in winter. Humidity: Moderate to high humidity. Use a humidity tray or mist the foliage regularly. If the relative humidity drops below 40% in winter, use a room humidifier. Brown leaf tips are a symptom of dry air, although this is common even on healthy palms. Temperature: Average room temperatures 60-75°F/16-24°C. It can tolerate a minimum of 55°F/13°C. Soil: Peat moss-based potting mix with added sand for quick drainage. Fertilizer: Feed monthly in spring and summer. Organic palm fertilizer contains the micronutrients this palm needs. Don't feed in fall and winter when growth has slowed. Propagation: Kentia seeds can be grown with a grow light and heat mat, but seedlings are slow-growing. You'll wait for years for seedlings to grow into a tall palm tree.